Students must sign up for a 30-minute block using iAdvise to prevent long wait times. All advising sessions will be held in Rawl Engineering Practice Facility, Room 200. When students arrive, they should have completed all tasks under “Know Before You Go” below. All students must attend Lean Cell Advising or students may not be able to enroll in courses until Fall 2017. AME Students must sign up for advising with iAdvise. AME has designated a 30-minute block sign up for students. The appointment should only take approximately 10-15 minutes as long as student comes prepared. Please note, all students MUST SIGN-UP FOR A TIME WITH iADVISE IN ORDER TO BE ADVISED. Log in to http://iadvise.ou.edu using your 4×4 and password. Select the Department Level Advisement (AE or ME at the School of Aerosapce and Mechanical Engineering), then select Make Group Appointment. Reserve an advising time slot (ex. 12:30 time is for 12:30-1:00pm time slot). You can only reserve one slot. Arrive at the beginning of your time slot. You will be seen sometime within that 30-minute time frame. The advising session should only take approximately 10-15 minutes if student comes prepared. If you do not reserve a time slot before attending Lean Cell Advising, you may not be seen if the time slot is full. 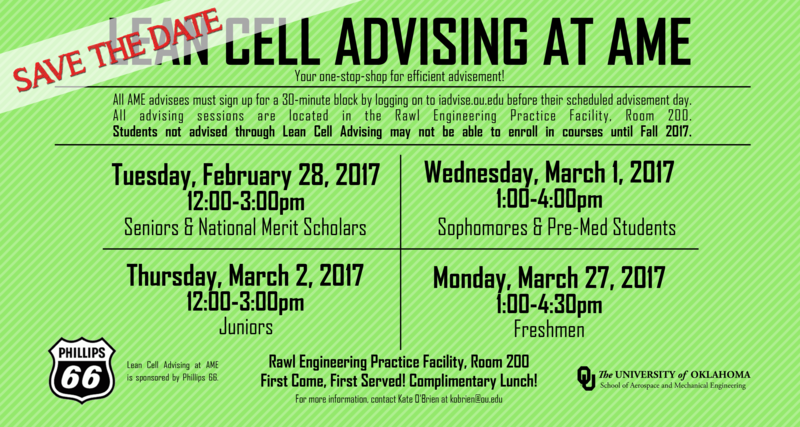 All AME Lean Cell Advising sessions will take place in the Rawl Engineering Practice Facility, Room 200. Freshmen are required to be advised by their University College, Athletics, or Honors/Scholars Advisor in order to be able to enroll. Do you have questions or concerns about advising, classes, your current major or school in general? Please know that aside from Lean Cell Advising, you are encouraged to meet with your College Advisor in the Williams Student Services Center (WSSC) any time you have questions, or concerns you wish to discuss in a one-on-one meeting. Lean Cell Advising is an advising process intended to provide a stream-lined process for meeting with your major faculty advisor while also addressing the multiple steps in theadvising/enrollment system without having to visit multiple offices and staff. HOWEVER, you can, and are encouraged to, meet with your WSSC advisor if you require or would benefit from more in-depth guidance and academic counseling. It’s easy to do! 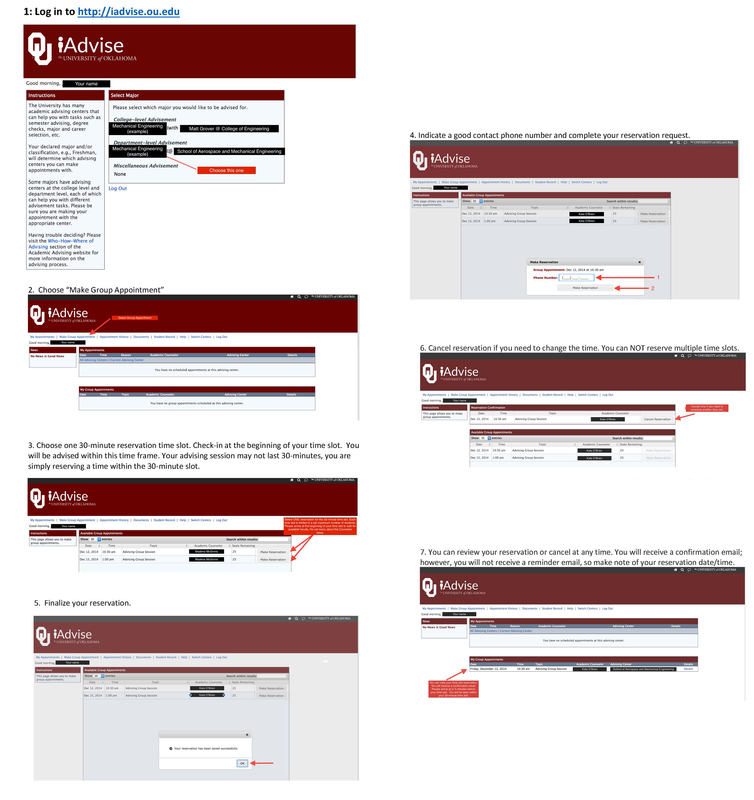 Log into: iadvise.ou.edu to access available appointment times for your specific advisor. Don’t see any openings? Click here to contact your WSSC advisor or call WSSC directly at (405) 325-4096. Do you have questions about career fairs, graduate school, internships and co-ops? WSSC advisors are here to assist you with Career Counseling. We encourage you to take advantage of this guidance as you prepare for your future as an engineer! For more information or accommodations on the basis of disability, please contact Kate O’Brien at kobrien@ou.edu.